With our trip home to Owasco Lake, comes a lot of firsts. What do doggies do on a lake? Obviously, swim! Milton was not thrilled with the idea of interacting with water again especially after that fated boat ride. We were adamant though that our little goldendoodle get back up on that horse! As with everything, we fed Milton treats before, during, and after the water to associate the experience as something good and tasty. My childhood dog, Brutus, was thrown off the dock when he was young and always hated the water after that incident. I do not want a similar experience to occur with Milt, so we delicately approached the entire introduction. Milt might not have loved the water, but on this trip we are going to keep on trying to cultivate at least some appreciation of it! Milton looks like a wet rat every time. It's uncanny! Any thoughts on how to help a dog like the water? 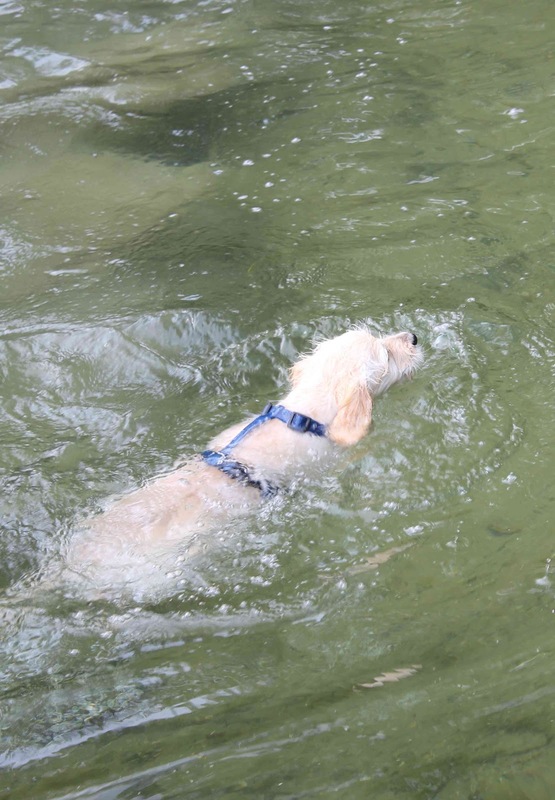 Both poodles and retrievers supposedly enjoy swimming, so we would love for him to be a water dog!